So, I know artist spotlights aren’t something I usually post, but . . . this past weekend while I was (having a blast) at Ichibancon, I got to meet an intriguing original artist. Going by P-shinobi under the label Boomslank, this artist has a fascinating, beautiful style that pulls strongly from anime-style influences. His work is a neat blend of conceptual stuff, odd perspectives, and surrealism that, while clearly influenced by greats like Hayao Miyazaki, is also refreshingly original. The content is everything from mecha to slice-of-life to some really amazing surreal stuff like fish in the sky (which looks waaay cooler than it sounds). Plus, I love the color schemes used in these prints, especially the use of lots of neutral colors combined with splashes of brighter ones for contrast and accent. So yeah, if you like anime-style art and are interested in some more original stuff, you should check out Boomslank’s offerings. 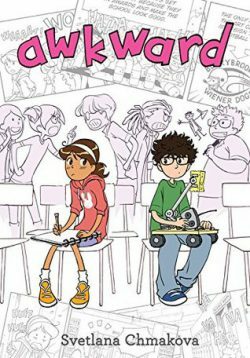 Peppi Torres manages to thoroughly mess up her first day in her new middle school by 1) tripping in the hall and dumping all her books, 2) getting helped by Jaime, a quiet kid with a reputation as a huge nerd, and then 3) pushing him and running away. Following this fiasco, Peppi does manage to find a place for herself in the school’s art club where she makes some good friends . . . even if she’s pretty much on her own during the rest of the school day. She still feels awfully guilty over pushing Jaime, especially when he begins tutoring her in math. And life becomes even more complicated when Peppi’s art club and the science club–of which Jaime is a member–become locked in a fierce competition for a table at the school’s cultural festival. Totally awkward, especially since Peppi finds that Jaime might actually be a great friend. I absolutely loved Awkward! I can’t believe I haven’t seen it getting more love. This is a fantastic realistic slice-of-life school story for everyone–in graphic novel style. The setting is middle-school, so obviously that’s the primary intended audience, but the story is great and the messages it holds are valid for everyone (I’d say upper elementary and older). The writing tone is great–it captures that, well, awkwardness of being in middle school and figuring life out and all extremely well. The things Peppi goes through are credible, the sorts of issues that real people actually deal with. But the story is also funny and immensely positive in its message. It’s a great encouragement to work hard, work together, make all sorts of friends, and believe in possibilities. The characters are rich and fun to read, full of personality and individuality. And the art does a great job of reflecting this, with expressive character designs, attractive coloring, and a layout that’s easy to follow and focuses strongly on the people. I would definitely recommend Awkward to all sorts of people, and especially to those who enjoy graphic novels or are at that, well, awkward stage of life themselves.